It was a crazy weekend. For starters, family from California were here for a quick visit. 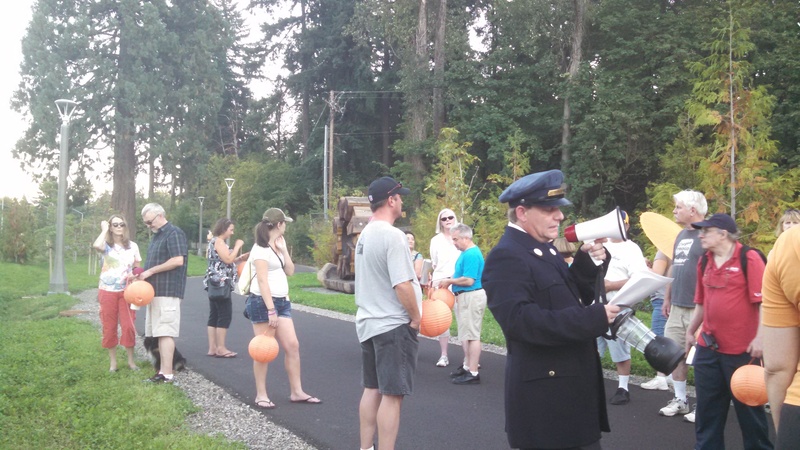 There was also a lot of hullabaloo over a new light rail line opening in Milwaukie. I missed much of the party because I worked on Saturday. Luckily, the festivities continued into the evening, when we walked on the Trolley Trail, which parallels the light rail line. A gentleman from the Milwaukie Historical Society gave a guided tour of the features along the way. That included artwork, infrastructure, and a Giant Sequoia. It was a nice walk on a trail usually populated by joggers and cyclists. In addition to a hectic Saturday, we were also booked Sunday for a good cause. 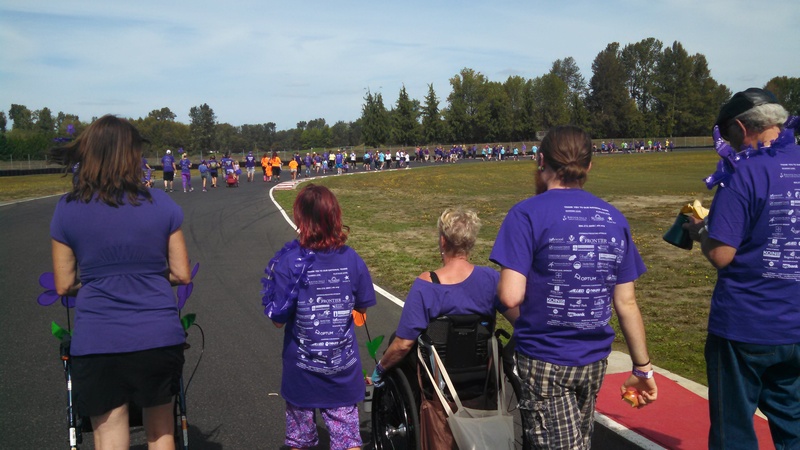 After breakfast, my wife and I picked up our son and headed to the Portland International Raceway to take part in the annual Alzheimer’s Walk to Remember along with Denise’s sister and brother in law, their daughter, and her stepdad. This event is a great cause we are proud to attend. Our team, AKA the Jackie Chan Champions, raised hundreds of dollars to help find a cure for the disease or minimize costs for caregivers. The weather was almost perfect. The walk around the 1.9 mile racetrack was accompanied by a zydeco band at the grandstands and a bagpiper who apparently walked the whole route. Some folks were pretty wiped out at the end, but very peppy cheerleaders motivated everyone at the end. This is a great event. The sea of purple spreads out at Portland’s 2015 Alzheimer’s walk. After walking both weekend days, I walked some more at work yesterday to deliver mail.I have to admit, I was a bit tuckered last night. We learned a few things about local history, did our part in fighting a disease, and played games late into Sunday night with family. I didn’t walk anywhere today. Life is good. 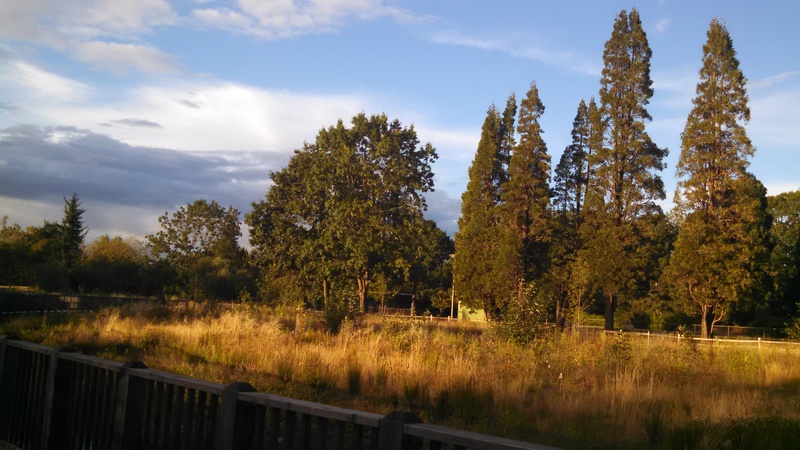 After work the other day, I met my wife and took a stroll in Portland’s Westmoreland Park. It has evolved a bit in recent years, with more paths and cultivation of gardens interspersed with ball fields and duck ponds. 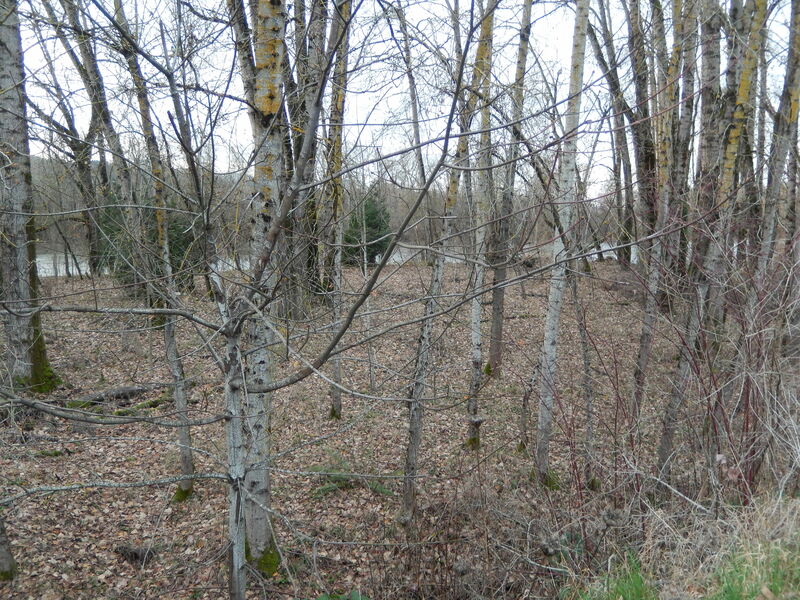 We discovered a long curving boardwalk and inspected a marshy area that was drying up. 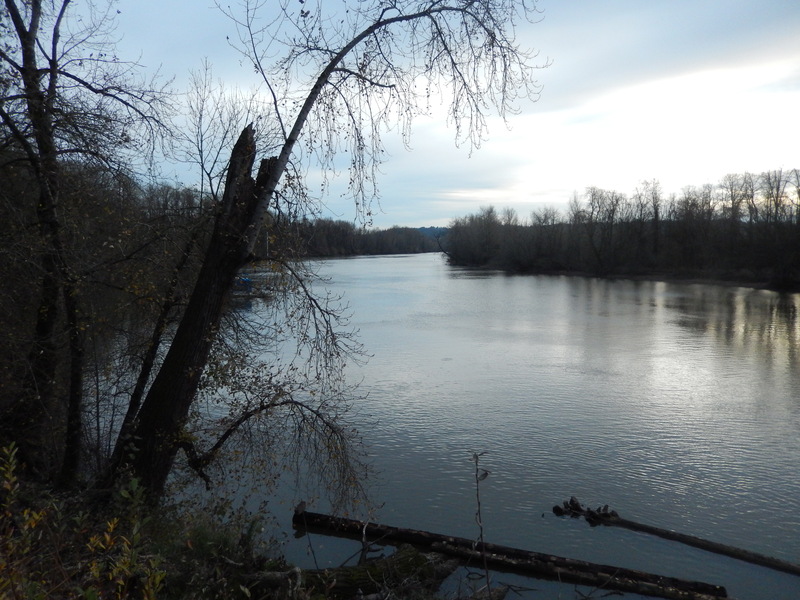 Oregon has finally received some rain, but we are still way behind in annual precipitation. Thankfully, the trees, shrubs, and grasses remain lovely. We consider ourselves lucky to have such a wonderful park close to home. 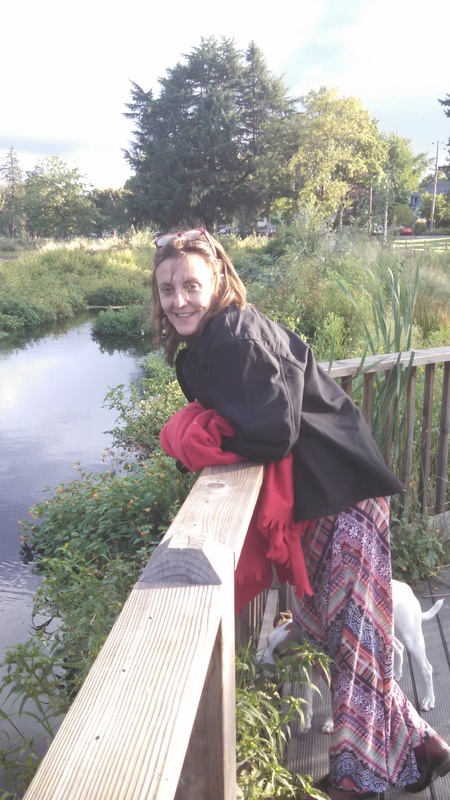 Denise pausing for a moment on the boardwalk. 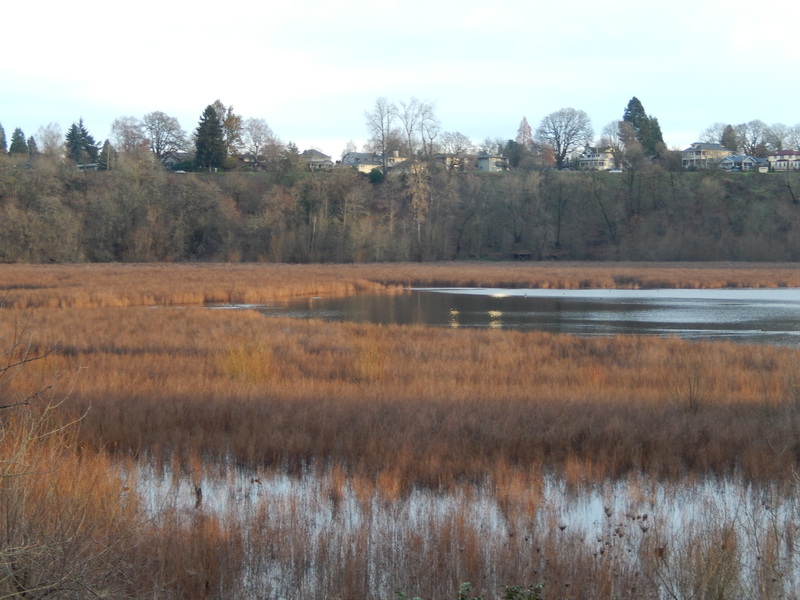 I have walked all over in the Oaks Bottom area in Southeast Portland. Some of those rambles have been documented on Hiking Northwest posts. 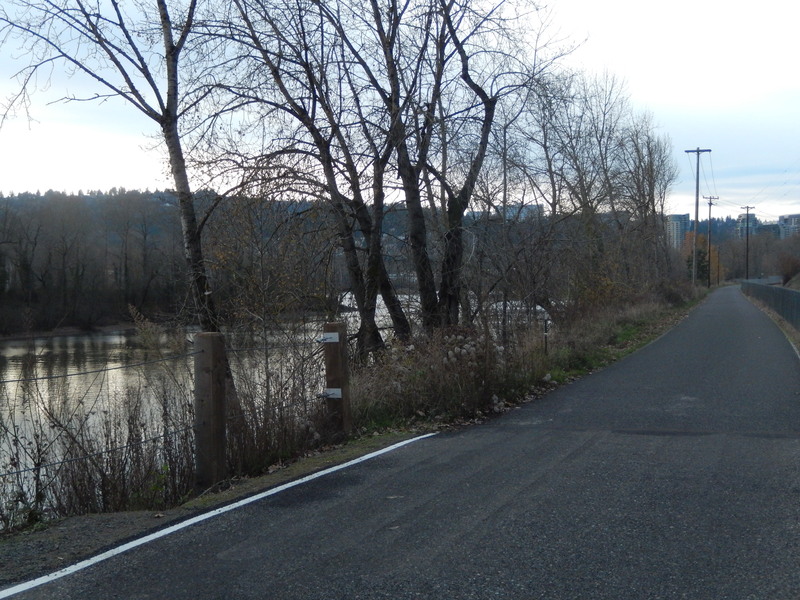 But I’d never walked on the Springwater Corridor bike path along the banks of the Willamette River, heading north. I wanted exercise and I wanted to see some new perspectives on the area. I got chilly but walked fast with my pup by my side. 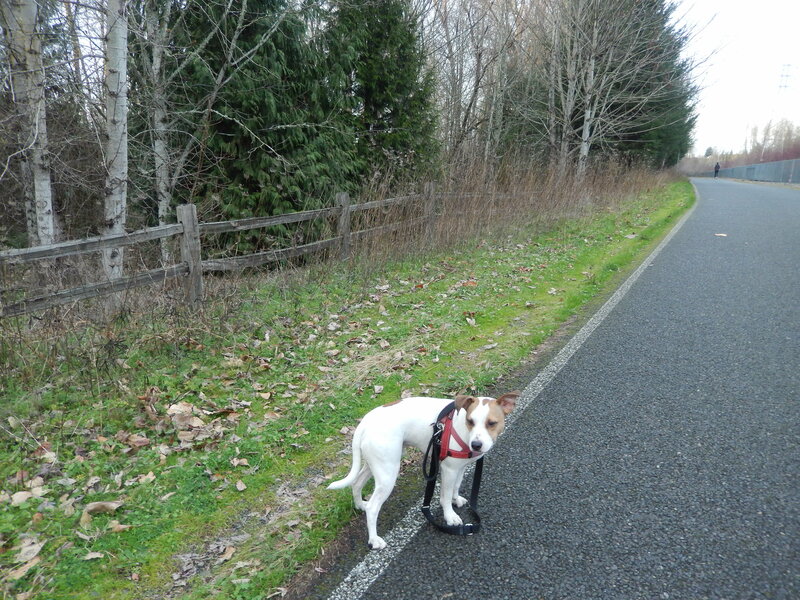 With lots of cyclists and joggers around, I had to keep Jackie leashed. 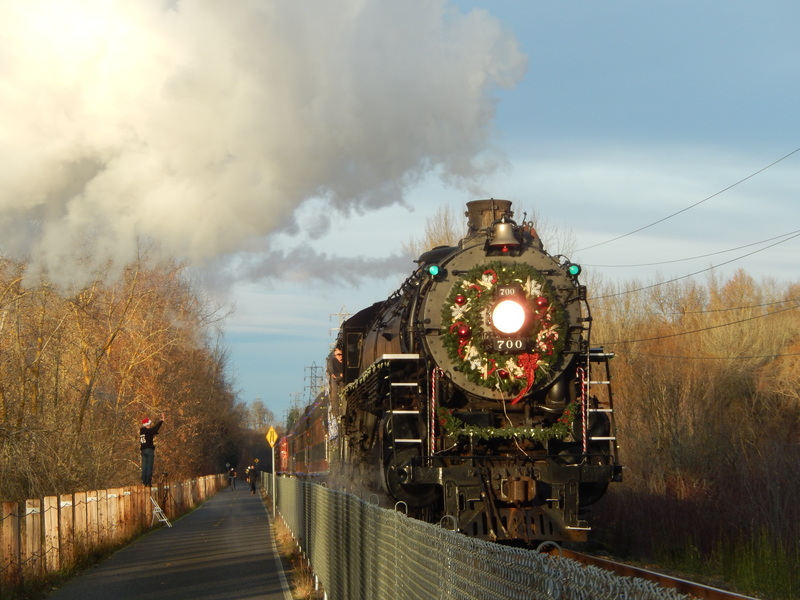 I got a special treat when I encountered a holiday steam locomotive giving passengers rides back and forth in the area. Looked like fun. Lots of people were out on the trail, but few were simply walking. There were serious cyclists who buzzed by as if the rest of us were annoying, casual jogge4rs, one very serious runner in very short shorts, and even a pair of inline skaters. They were not wearing neon. 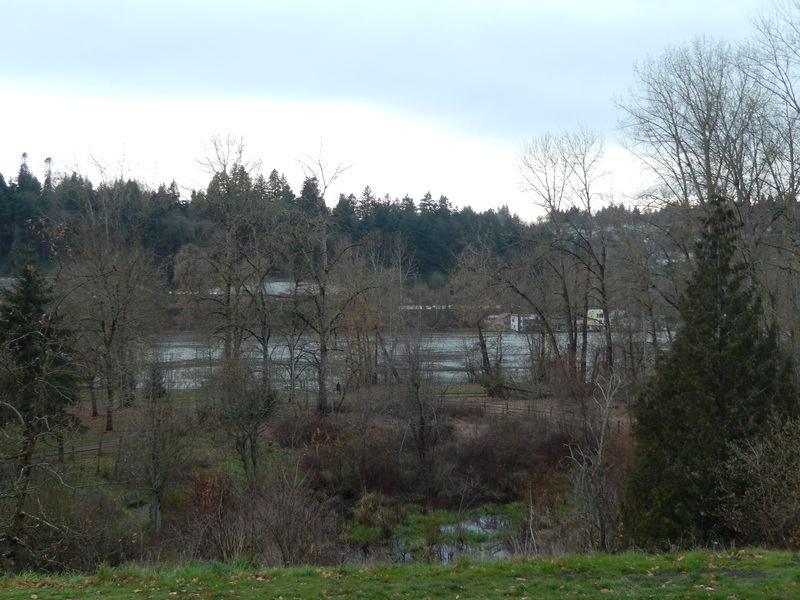 When my wife and paddled to Ross Island last summer, we’d seen the path break into the open along a steep bank. Now I wanted to get to that spot, but it was farther than I realized. I walked fast, but daylight was waning rapidly. 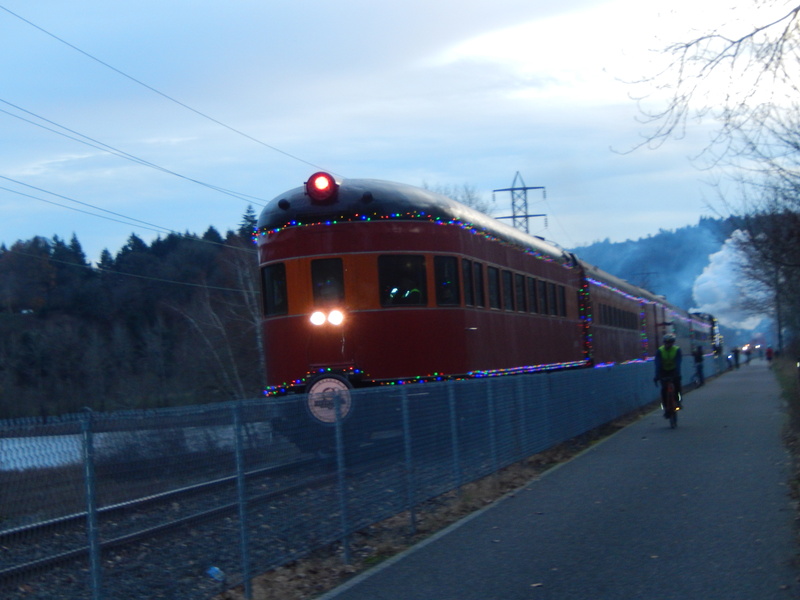 Along the way, I stumbled onto a special steam locomotive holiday train. It passed me one way and later passed me another way on the return trip. I wanted to enjoy the moment more, but it was chilly. Jack was shivering. We were both glad get back to the car and head home.